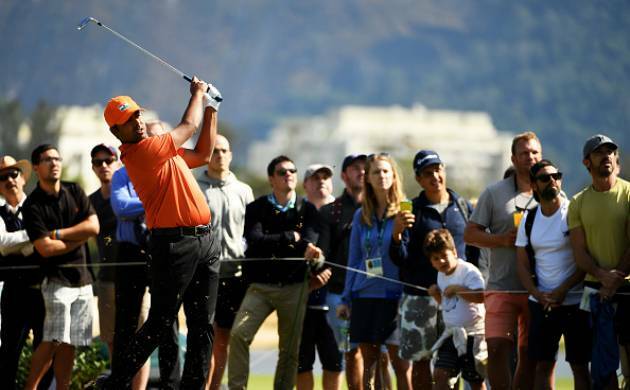 India’s Anirban Lahiri and SSP Chawrasia had a topsy-turvy start to their campaign at the Rio Olympics as they carded a three-over 74 and even-par 71 respectively in the opening round of the golf competition on Thursday. Asian Tour No. 1 Lahiri and India Open champion Chawrasia were tied 49th and tied 27th respectively on day one as golf returned to the Olympics after 112 years. Lahiri dropped five bogeys against a couple of birdies, while Chawrasia’s four birdies were erased by his four bogeys as the duo found it difficult to tame the Olympic golf course. At the top, Australia’s Marcus Fraser fired a sizzling eight-under 63 to lead the clubhouse, followed by Canada’s Graham Delaet (66) and Thomas Pieters (67).Lahiri did not have a good day in office as he started with a bogey and then stumbled on two more bogeys at the sixth and eighth holes to make the turn at three-over. On his resumption journey, Lahiri lost a couple of strokes at the 11th and 12th holes before he produced two birdies at the 15th and 18th holes to end the day on a positive note. Chawrasia too had a topsy-turvy day as he picked up two birdies at the second and fifth holes before dropping a shot at the seventh to lie one-under after the front nine. The Kolkata-born golfer had a disappointing back nine as he initially let the advantage slip with three bogeys at the 10th, 12th and 13th holes against a birdie at the 11th. But a birdie at the final 18th hole helped him end on an even-par.